The device is designed for automatic cutting of skin from the vent to the breast bone, starting at the opening cut by the vent cutter. The device is placed as the second one in the evisceration line, after the vent cutter. The device is manufactured with shackle pitch of 6". Frame – the base of the machine. 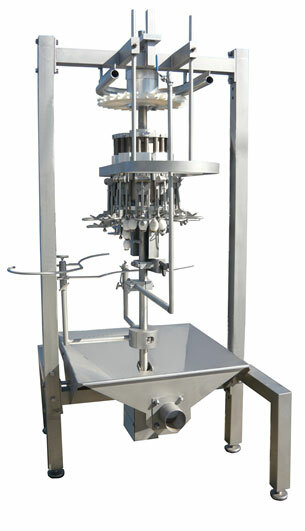 The frame also includes the drip tray, guides and height adjustment system. A drum is seated upon the frame, which can be freely moved up and down, as needed. Drum with central shaft, upper and lower plates, cam and the cutter assembly. The cam is mounted to the central shaft, which, in turn, is mounted to the frame. The cutter assembly, mounted to the upper and lower plates, rotates around the cam of the central shaft and must be aligned with the overhead conveyor. Drive unit, consisting of the track curve and drive wheel. The drive wheel is driven by the overhead conveyor. Birds enter the device with their backs towards the inside of the machine. The device is of carousel type, driven by the overhead conveyor. The cutter assembly, fitted with an exceptionally sharp blade, provides a uniform and clean cut. The blade holder is designed so that the viscera are pushed away from the cutline, which prevents infection. After every turn, the cutting heads are washed and cleaned.